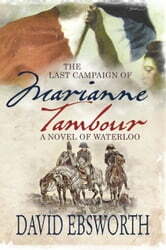 On the bloody fields of Waterloo, a battle-weary canteen mistress of Bonaparte’s Imperial Guard battalions must fight to free her daughter from all the perils that war will hurl against them – before this last campaign can kill them both. Praise for David Ebsworth’s novel, The Jacobites’ Apprentice, critically reviewed by the Historical Novel Society, who deemed it "worthy of a place on every historical fiction bookshelf” and named it as a Finalist in the Society’s 2014 Indie Award. Each of David Ebsworth’s novels has been awarded the coveted B.R.A.G. Medallion by the worldwide Book Readers Appreciation Group. I'm a big fan of Bernard Cornwell and the Sharpe series. But I recently read Sharpe's Waterloo and was a bit disappointed. Then I came across this new take on the story and fell in love with it! Apart from anything else, it was really refreshing to get a picture of the battle from a French viewpoint. More important, this one tells the battle's tale from the angle of some fabulous characters, including two very feisty women. If you don't read anything else in 2015 - the bicentenary of Waterloo, after all - make sure you read this one. Historical Fiction at its very best.